A group of Israeli terror victims lashed out at Secretary of State John Kerry on Wednesday in an open letter that accuses the U.S. leader of wrongly pressuring the Jewish state to free 104 Palestinian terrorists ahead of Middle East peace talks. "You have encouraged the government of Israel to free more than a hundred convicted terrorists, almost all of them killers," a group of 18 families whose relatives were killed by Palestinian terrorists wrote to Kerry. The families, who call themselves the Bereaved Families for Peace and Justice, are asking that Kerry meet with them so that they can explain "why being complicit in turning the killers of our children and parents into heroes and ‘freedom fighters’ must not be part of any policy befitting a great nation and moral exemplar like the United States." 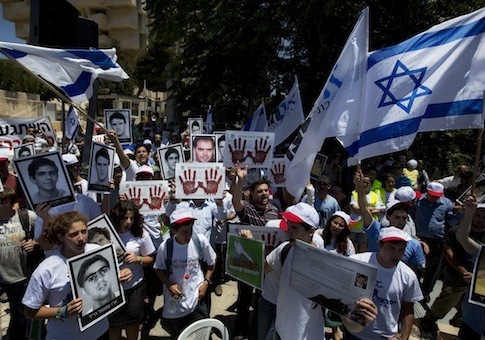 The families organized two protests on Sunday and Monday in front of Israeli government buildings to express their opposition to the prisoner release deal, which they described as "a tragic mistake." Twenty-six Palestinian terrorists were released Tuesday evening ahead of peace talks. Those freed included a terrorist who murdered a Holocaust survivor as well as others who were serving life sentences for the killing of Israeli citizens. "We are turning to the government of the United States whose leaders have been instrumental in extracting from Israel a painful, damaging decision that—even now, before it is fully carried out—is already being cheapened by Arab voices," the letter states. "We say to you, as U.S. Secretary of State, and to your colleagues in the Obama administration: You will not find ordinary citizens anywhere, and certainly not in Israel, who are more convinced of the need for painful compromise and of bilateral concessions in the pursuit of peace than we are," they wrote. restaurants and of buses and those who sent them," they wrote. "To think otherwise is to admit a fatal flaw to the plan to bring an end to the hatred." The Palestinian Authority has asked its officials to refer to the released terrorists as "freedom fighters." PA President Mahmoud Abbas has already celebrated the return of the terrorists, posing for pictures where he can be seen hugging those released. The Israeli terror victims have asked that Kerry sit down with them during his next visit to the region. "We ask you to make time to meet with a small group of us when you come back to this area in the coming days. We urge you to re-connect with the human dimension of the process you have started," they wrote. The families believe that Palestinian insistence on the release of these terrorists is a sign that they are not committed to living in peace with Israel. "The willingness to make huge efforts to get them out of Israeli prisons tells us much about how Arab society sees them and the way they symbolize victory in the fight with Israel," they wrote. "A string of prison breaks attributed to al Qaeda in the last month freed hundreds of jailed terrorists across the Islamic world, showing how imprisoned terrorists are an invaluable resource." "Freeing them justifies serious effort," the letter states. "Yet Israel is handing them over with nothing tangible in return." Asked about the timing of the letter, Bereaved Families spokesman Yossi Zur told the Washington Free Beacon that it "was put in motion by John Kerry and his agenda." "We wanted to ask him why he pushed Israel to do what U.S. would never do," said Zur, whose son was murdered by a Hamas bomber while riding the bus in 2003. "We wanted him to see us and hear first hand what we think and how it feels," Zur said. The State Department is currently considering the letter. "We've received the letter yesterday, and we’re reviewing it," State Department deputy spokeswoman Marie Harf told the Free Beacon. "It's important to note that the secretary both respects the exclusive right of the Israeli government to make these decisions, and has applauded the courage of both parties to make difficult decisions as part of this process," Harf said. "The decision to release these prisoners was taken by Israel only after the most serious review, at the highest levels of the Israeli government. Prime Minister Netanyahu made a tough decision that he determined was in the best interests of the Israeli people." This entry was posted in Issues and tagged Israel, John Kerry, Middle East. Bookmark the permalink.